So how did your meeting go with them, or did they send you some further parts? I am interested in an Intake but this review is absolutely scathing and puts me off massively. It's been over a year since they promised to improve it, and apart from an initial spurt of enthusiasm at the start, absolutely nothing! What a way to run a business, eh? Google searches will take people to this site and Racingline have done zero damage limitation. The last comms I got from them was Autumn last year, pointing the finger at ITG, but when companies start with the whole blame game thing, I lose interest. Take ownership of the problem and deal with it, or get lost and waste someone else's time. Ah, I think I may have read something about your experience on another post. Wow, sounds like i'll be staying well clear of that system. Are you saying that it's best to come up with a frankenstein of parts with he 42DD MAF housing? It comes in either through or non-through, which I have no idea what the difference would be. It just looks smaller. .. Or is it designed to be used with intake systems that are already out there? You can get a full system from 42DD, mounting hardware, heatshields, everything... however it's $520. Or Pudding might have been eluding to the fact you could get all parts yourself, individually and save some cash. So a velocity stack, filter, heatshield, some aluminium piping and just buy the 42DD MAF housing. Yeah I meant buy the 42DD MAF housing and source the pipework and filter yourself. The MAF reading is critical. I have no idea why it's oval shaped on the MK5 and round on the MK4, 6 & 7, but it's what VW used and deviating from that seems to cause less than satisfactory running at light loads. I have a suspicion it's because the turbo is so close to the MAF on the MK5, and an oval would reduce swirling vortexes, which MAFs don't like......or something. This is how to build an intake! Nice - doesn't look the prettiest but who really cares eh? I think building your own intake is quite a class project to do. My main concern or frustration though is finding the right parts for mounting properly. For example the front moulded heatshield / hardware that sits near the battery, looking OEM'ish and containg the air filter and potential velocity stack. Also I'm not a welder so buying a steel pipe and getting mounting points made up isn't realistic. I wonder if i'm worrying about nothing, and need to just find a decent local machine shop. I hate the look of that one but love how it uses all the original mounting points. Really well designed. By the way, ECS do a black version, and also an enclosed carbon airbox version of that intake for better looks. 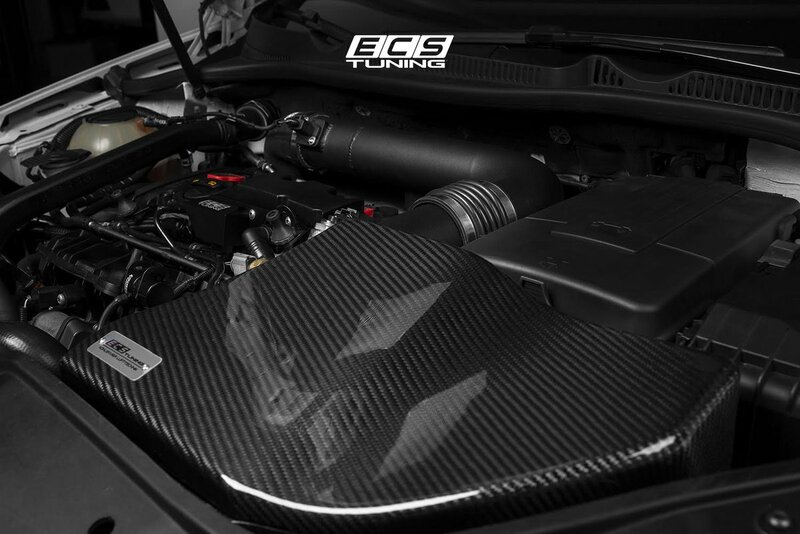 I really like the look of the enclosed intake sold by ECS Tuning and made by Kohlefaser Luft-Technik. Not sure if the area of that scoop is smaller than the intake tube section. Are you sure it isn't enough? What's the size of the TTRS intake scoop for the OEM air box which is perfect for our engines to work at +400 bhp? Pretty sure the cross sectional area of that rectangle is smaller than a 3" pipe. Remember the OEM intake doesn't draw all it's air in through that rectangle opening. There's a big hole (snow/water drain) underneath where it draws the bulk of it's air in.